Best Time to Visit Seychelles - A Guide from Holidayguru.ie! The Republic of Seychelles (known by most people as Seychelles) is made up of around 115 islands. These islands are divided between the inner and outer islands. Its location near to the Equator brings a lot of sunshine, and average temperatures on the island are between 24 and 30 °C. The average humidity is 80% due to the rainfall. Monsoons determine the tropical climate in Seychelles. The northwest monsoon dominates the months of December to March, the rainy season in Seychelles. January is the rainiest month. From April to May, there is almost no wind and around eight hours of sunshine per day and, due to the monsoon change, a sultry weather. April, at 26 to 31 ° C, is the hottest and most humid month of the year. In the months of May to September , it can be a bit windier and stormy by the southeast monsoon, but this is also the rainiest season. The months of July to August are the coolest months with temperatures between 24 and 29° C. Heavy storms are rare in the Seychelles despite the monsoons. In the transition period from October to November, you can expect about seven hours of sunshine per day. There is little wind and due to the monsoon change a high humidity of more than 80%. Detailed information on the climate in Seychelles is found in the climate table. The data show the best time to visit Seychelles , although it depends on various factors, such as the desired activities. Learn more below! Although it’s warm and tropical all year round, the following months are the best time to visit Seychelles . They are best for a Seychelles holiday due to lower rainfall and less humidity . The best time to visit Seychelles are the months of May to October. The reason for this is the dry and less humid weather. The high season is the months of June and July . The remaining months of the year are also suitable for a holiday in Seychelles. On average, it is tropical, rainy and humid in the months of November to April. But the offseason has other benefits. Travel, flights and hotels are cheaper and the rush of tourists is over, so nothing stands in the way of a quiet holiday on this dream island. The rainy season isn’t so bad as you would assume. Seychelles usually has only a brief tropical shower. Then the sun comes out again and allows a nice beach holiday. On flat islands like La Digue, the rain probability is lower even in the rainy season than on the islands with higher elevations like Mahé. If you travel during the low season and it rains on your island, try a little island hopping. There are good ferry connections between the popular islands of Mahé, Praslin and La Digue. Seychelles is a tempting destination year-round. Depending on how well you can handle the humid weather, the off-season is as attractive as the peak season. If you plan your Seychelles holiday, it is important to think about what you want to do locally. For each activity, there is a better or less ideal travel time. The best time to visit Seychelles for divers are the transitional months between the two monsoons in Seychelles. During the monsoon change, it is windless in Seychelles. 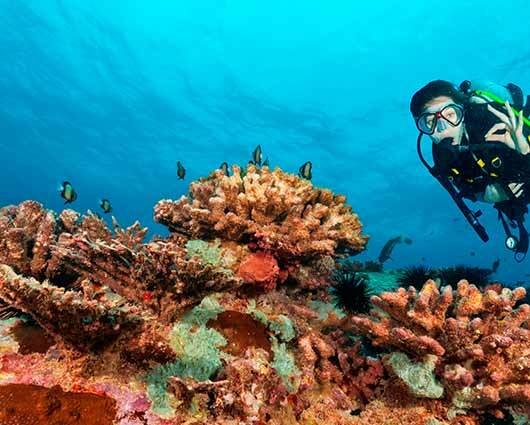 Thus you have perfect conditions for diving and good visibility. Do you want to dive in Seychelles and see as much of the underwater world as possible? Then the best time to visit Seychelles is in the periods from late March to mid-May and mid-September to mid-December. You can snorkel well all year round. Visit in the rather stormy months of May to September, with beaches with an upstream reef. There you can reach the very high waves less and you can snorkel and swim without worry of danger. 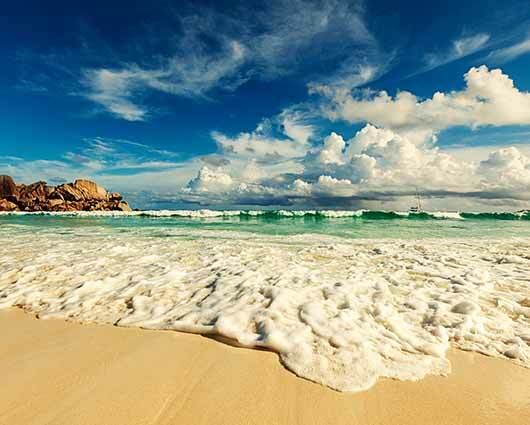 Whether summer or rainy season – Seychelles is perfect for a nice beach holiday all year round. Outside the rainy season, the currents on the Indian Ocean are a bit more violent. The windward southeast-facing beaches especially experience a restless sea and high waves. If you bathe on a beach with an offshore reef, you do not need to fear anything, but you can ride wonderfully on the waves. If you want to bathe in a calm sea during the best travel time in May to October, then you should visit the north and west beaches. They are sheltered from the wind and allow a fantastic beach holiday in the high season. If the divers are looking for a windless month for a holiday, it is the other way round for surfers and windsurfers. The wind provides the perfect waves. That’s why the best time to go surfing and windsurfing in Seychelles is from May to September – the peak holiday season. If you like sailing, you can do so all year round in Seychelles. Many sailors appreciate the windless months a little less. If you are one of those, then the best months for sailing are from May to October. 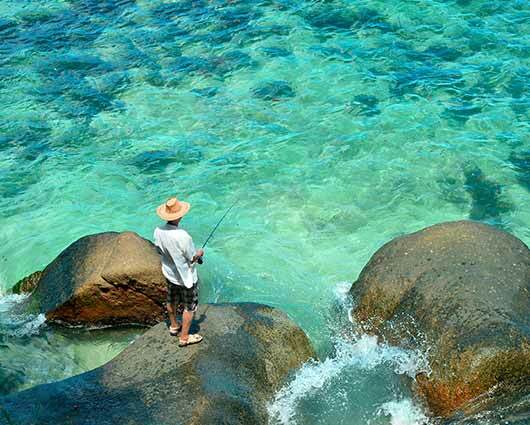 Is your hobby or professional fisher and would like to pursue your leisure activity on your Seychelles vacation? Then you should look to visit in the months of October to April. During this time the perfect weather conditions prevail for fishing. For hiking, the windier months from May to September are best. During the rainy season, hiking is also possible, but also a little more laborious, as it is sultry and tropical hot. The Seychelles Islands attract tourists from all over the world with a daily average temperature of 30° C all year round. The climate in Seychelles is tropical warm due to monsoons. The best time to visit Seychelles is from May to October. Due to the southeastern trade winds, it is windier, it rains less and it is, therefore, less humid on these dream islands in the Indian Ocean. Depending on what you are looking for in Seychelles and how much you want to invest in your vacation, the off-season between November and April is interesting for you. For diving, the windless transitional months between the monsoon are better, for example. In addition, the prices for trips in the rainy season are cheaper on average. Decide for yourself when you want to fly to the East African dream islands and have a wonderful time!